I received my PhD from the Department of Electrical and Computer Engineering of the Democritus University of Thrace, Greece in February 2016 on the application of game theory to network QoS problems. Previously, I received my MSc in Artificial Intelligence from the University of Edinburgh, U.K. with a full Bodosaki Foundation scholarship in August 2006. At the undergraduate level, I received my Informatics degree from the University of Piraeus, Greece in 2005 having graduated with distinction. I am also an experienced software designer and developer, having participated in numerous research projects both as an academic and as a developer. My full C.V. is available in screen (with hyperlinks) and print (no hyperlinks) versions. 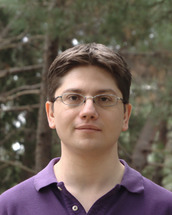 Supervised by Pavlos S. Efraimidis, Associate Professor. International Journal of Communication Systems, ISSN 1099-1131, John Wiley & Sons, Ltd, December 20, 2016. Journal of Internet Engineering, pp. 355-362, Vol 6, No 1, Klidarithmos Press, February 2016. Journal of Computer Security, pp. 383-413, Vol 22, ISSN 1875-8924, IOS Press, 2014.
International Conference on Algorithms and Complexity, pp. 197-208, Barcelona, Spain, Lecture Notes in Computer Science 7878, Springer, May 2013. Journal of Internet Technology, pp. 117-126, Vol 14, No 1, ISSN 1607-9264, Airiti Press, January 1, 2013.
International Conference on Multimedia and Ubiquitous Engineering, pp. 89-94, Loutraki, Greece, FTRA, June 2011. Heritage Tourism and Hospitality International Conference, Istanbul, Turkey, ISBN 978-975-518-372-5, Bogazici University, November 2014. Hellenic Conference on AI (SETN), pp. 615-629, Ioannina, Greece, Artificial Intelligence: Methods and Applications, Lecture Notes in Artificial Intelligence 8445, Springer, May 2014. Journal of Network and Computer Applications, pp. 103-125, Vol 36, No 1, ISSN 1084-8045, Elsevier, January 31, 2013. Manual of Wise Management, Preservation, Reuse and Economic Valorisation; of Architecture, of Totalitarian Regimes, of the 20th Century, pp. 176-182, ISBN 978-961-6823-32-6, ATRIUM, South East Europe Transnational Cooperation Programme, January 2013. WSEAS Transactions On Information Science & Applications, pp. 762-766, Vol 1, No 2, ISSN 1790-0832, August 2004. WSEAS Transactions On Information Science & Applications, pp. 752-756, Vol 1, No 2, ISSN 1790-0832, August 2004.
International Conference on Applied Mathematics, Corfu, Greece, WSEAS, August 2004.